MainStay Suites is conveniently located in North Raleigh near intersection of I-440 and US1 North/Capital Blvd. with easy access to Downtown, North Carolina State, Shaw and St. Augustine's Universities, Peace and St. Mary's Colleges, Alltel Pavillion, Walnut Creak Softball, Highwoods Office Park and The MarqE Entertainment Complex. Suites are offered that provide a home like atmosphere when you're away from the office and an Office when you're away from home. 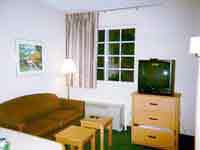 Suites include fully equipped kitchens, spacious living area, remote control TV's, free continental breakfast.